the Maiden, the Mother and the Crone. into a single shape: the Astrological symbol of Venus. At the foundation is the Maiden. a promise of the future’s ever changing opportunities. and instructs the maiden with her accumulated wisdom of her own maidenhood. the possibilities that fertility offers. She is flanked with the stems of the rose illustrating life itself. 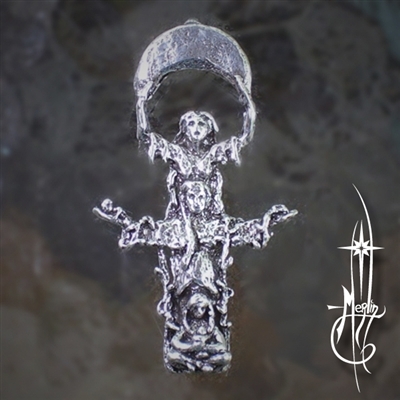 Above the Mother and below the sickle moon is the Crone. brought to generations of Women for eons. and reveals the destiny of those who seek her. Spirit over Matter: the symbol of love itself. the knowledge of a better life. that may be worn but also a focus of life itself. it also is designed for small alters dedicated to life.